A powerful rainstorm in Nepal has killed at least 28 people. Villagers who survived a powerful rainstorm that killed at least 28 people and injured hundreds in southern Nepal searched for food and shelter Monday as rescuers struggled to reach remote areas. High winds during the storm Sunday night flipped cars and blew a bus carrying at least 40 people off a highway, killing some. Police said most of the deaths were caused by collapsing walls and falling bricks in homes and toppled trees and electrical poles. 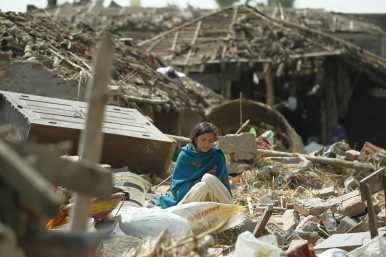 The storm swept through villages in a farming region in Bara and Parsa districts. The government administrator in Bara, Rajesh Poudel, said 27 were killed there. One person died in neighboring Parsa, administrator Narayan Bhattarai said. The area is about 120 kilometers (75 miles) south of the capital, Kathmandu. Police officers and soldiers were helping people injured by the rainstorm. Villagers from neighboring districts were also distributing food to the victims. Prime Minister Khadga Prasad Oli canceled a visit to western Nepal and was flying to the area to observe rescue efforts, his office said. The National Emergency Operation Center in Kathmandu said 612 people were injured and teams with tents and other materials were sent to the area. Injured people were still being brought to Narayani hospital, the largest in the region, Dr. Sushil Pokhrel said. He said 395 patients had been treated. Beds were filled to capacity and patients were lying on the floors of corridors at the hospital. Villagers salvaged what they could from what was left of their homes in Bharwalia village, where most people live in huts made of mud and bricks with straw and stone roofs. Most of the huts were blown down by the strong winds, leaving people without shelter or food. “The storm took everything we had, including all the goods we had. We have no food to eat or any roof over our heads,” said Jebeda Khatung, who was digging through the debris in hopes of finding some of her belongings. All four members of her family survived. “It began with a hailstorm and rain and the wind picked up. The roof was shaking and when I went to check if the roof was damaged, the door was blown open and I was thrown on the ground and hit my head,” said Mamata Devi Patel, whose head was wrapped in a bandage. The bodies of four people killed in the village were cremated on the bank of the Trivenighat river as families gathered around for the Hindu funeral service. Local television showed the injured being taken to a hospital in cars, ambulances, and even on motorcycles, but roads in many villages were blocked by fallen trees and electricity poles. Pre-monsoon storms with strong winds and rain are common in March and April. The provincial government announced 300,000 rupees ($2,725) in financial assistance for families of each of the dead. By Upendra Man Singh for the Associated Press.